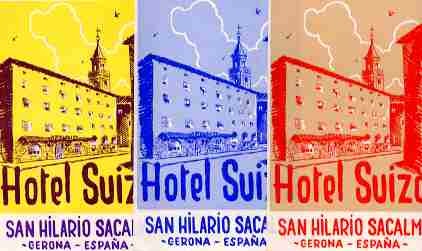 What is a rare hotel luggage label? What indeed? I am often tempted by advertisements for "rare hotel labels" only to find that the offer is for the sort of labels that are less desirable than yesterday's newspaper. So, at the risk of sounding pretentious, I decided to put some thoughts to the screen on this matter. Of course, my opinions are mine alone and I do not aim at (or look upon to-) imposing them to others. So, if you decide to read further, you do so at your own risk of getting unbearably bored. Any pebble you pick from the beach is unique. Nevertheless you would not say it is "rare", because no one really wants to keep it. So, rarity is linked to desirability. Also, the fact that there are only 900,000 units of whatever and there are 900,001 people who would want to have one unit, does not make the item rare. It may be expensive, because there is a demand unbalanced by offer, but the item is not rare because there are so many of them available. You can easily get one, it is just a matter of price. So, the rare item is desirable, there are very few of it known to exist and the offer is nil or nearly so against a high demand by collectors ready to pay a bonus-price. Applying these concepts to labels, the rare label will have to: i) be very old, typically well over 60 years because practically all post- WW II labels are available in fair to large numbers; ii) have one or more desirable characters that guarantee a demand (a particularly attractive design, or maybe a connection with a given hotel, artist or printer that makes it wanted); and iii) be available in negligible numbers (if at all) compared to the demand. Let's now discuss a few examples. The label at left is for a hotel in the town of Pilsen, not far from Prague. It dates from 1897, when the territory was part of the Austro-Hungarian Empire. Pilsen was not a spa nor was it a touristic town that attracted foreigners. This particular label was saved because it was used to shut a letter close. I have never seen another copy and since it was saved because of an undue use and not as a result of a collector's endeavor (collector's usually obtain labels in series) it may well be the only surviving specimen of maybe a thousand labels. Is it rare? This label came on auction for around $6.00 and of the many visitors I was the only bidder. Therefore it does not qualify as rare because it lacks desirability. Take, now, the label at right. The hotel, one of the oldest still in operation, is mythic because Byron stayed there on his tour related in "The Pilgrimage of Childe Harold". The label is a beautiful design by J.Paschal which was known to collectors by some color xeroxes of unreported origin. Thanks to a friend I was able to trace it and research its origin. It had been picked at the hotel just before the Great War by a lady who lived nearby and was subsequently framed. 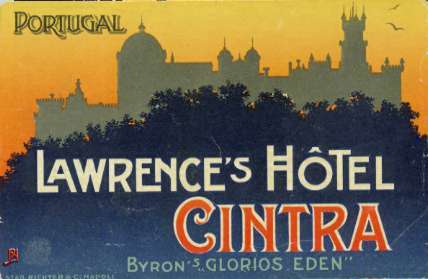 The hotel closed in 1914 for a long period and reopened with a different name. I consider this a rare label indeed as I have never seen another copy... There might be an eager demand for, say, 5 more copies and a relaxed demand for a further 20. But if a hoard of 20 identical labels was found, it could no longer be said to be rare! 40 years ago these sets were very much in demand but unobtainable. Then, they were very rare albeit recent! Can they be said to be rare today? The answer is "I don't know". This is a unique case in which the print run is known to be extremely small (the run applies to the whole set, as some colors were used as normal labels and therefore printed in quantity). Yet, no set has ever come into the open market for sale. So, we don't really know whether it is desirable. You tell me! Is it? ahn, ahn? ?